By Jon Greenberg on Monday, February 26th, 2018 at 11:49 a.m.
Editor's note: Have you ever wondered if the movie you just saw -- that claimed to be based on a real story or historical events -- was really accurate? So have we. With this year’s Oscars featuring historically based movies up for honors, we wanted to help you sort out the facts from the dramatic liberties. (We've also factchecked Dunkirk and The Post.) Warning, major spoilers and plot points ahead! The movie Darkest Hour delivers a riveting 125 minutes of Winston Churchill’s first weeks as Britain’s prime minister precisely as Western Europe crumbles under the Germans’ blitzkrieg assault. The production is up for six Oscars, including Best Picture and Best Actor. Gary Oldman captures Churchill as he wrestles with his inner desire to fight Adolf Hitler at any cost and the political pressure to negotiate terms. The film purports to take us through 20 days in May 1940, after the German offensive in Europe triggers the fall of Prime Minister Neville Chamberlain. Churchill takes over, because he is the one man who’s both willing to take the job and enjoys enough trust among the opposition party to assemble a government. With each day, the battlefield reports from Belgium, Holland and France turn more grim. The status of the main bulk of the British Army, well over 300,000 men, grows increasingly precarious. Ultimately, they end up on the beaches of Dunkirk in France, desperate for evacuation across the English Channel. The question for us is how well the film tracks with what actually happened. In the view of many historians, it’s pretty solid — for a movie. If you’re prepping for a history test, go read some books. Meanwhile, here's our rundown of what's right and what's wrong. • Churchill firmly believed war was the only way to stop Hitler and he never truly questioned it. • The War Cabinet debates over negotiations were intense, but Churchill had plenty of support. • Churchill was ready, however much it sickened him, to sacrifice 1,000’s of troops to delay the German advance and buy time for the hundreds of thousands on the beach at Dunkirk. • Those bold timeline graphics in the film? Don’t take them literally. • The navy activated the small boat pool well before Churchill thought of it. • Some great scenes, like the King dropping by in the middle of the night, never happened. • Yes, Churchill sometimes did give the V for Victory sign backwards, and he probably knew exactly what it meant. 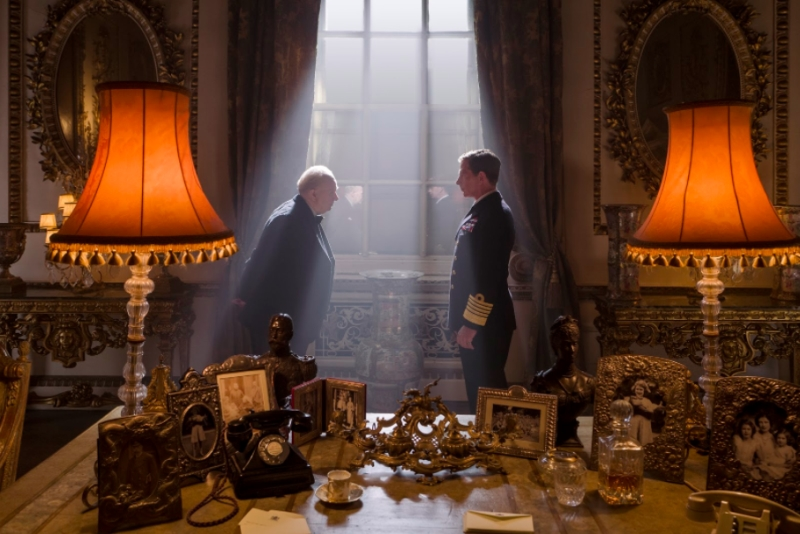 In the movie: Churchill’s fighting resolve wavered. Much of the tension in the film revolves around the political scheming to get Churchill to ease off his full-throated commitment to stop Hitler. Churchill’s opposition is Viscount Halifax, the foreign secretary in Churchill’s War Cabinet. In the movie, Halifax sees negotiations as the only way to save Britain. No one questions that the pressure was real. From the War Cabinet minutes at the British National Archives, it is clear that Halifax pressed Churchill to explore negotiations. "Halifax’s suggestion was not to negotiate directly with Hitler, but rather to inquire about possible peace terms through (Italian leader Benito) Mussolini, as Italy was nominally neutral at this point," said Allen Packwood, director of the Churchill Archives Centre at Cambridge University. In addition, the French wanted Britain to cut a deal with Italy so France could free up troops on its east and use them against the Germans. Churchill was firmly skeptical that anything would come of any talks. Michael Bishop, executive director of the National Churchill Library and Center at George Washington University and executive director of the International Churchill Society, said the movie might have conveyed a sense that Churchill wobbled more than he did, but he credits the writers for capturing the nuances of the political game he played. "He wanted to avoid looking too bellicose," Bishop said. "In the War Cabinet meetings, he was willing to entertain ideas that he didn't believe because he didn’t yet have the political strength to easily overrule Halifax and Chamberlain." In the movie: A conspiracy brews to unseat Churchill. In reality: Frustrations, yes. Plotting, no. The movie shows Halifax and Chamberlain seeking to oust Churchill over his unwillingness to begin to consider a diplomatic solution. The historians said that is blown out of proportion, especially for Chamberlain. "Chamberlain was on both sides of the issue," Bishop said. "The record shows he seemed to shift depending on the circumstances, and how he felt at the time. It’s a human thing." Historian and author Andrew Roberts told us Chamberlain supported Churchill, a "fact that you would not have guessed from Darkest Hour," Roberts wrote in The Times. As for Halifax, Packwood said he is skeptical that he aimed to set up Churchill to fail. "You could argue that in proposing mediation, Halifax was only doing his job as Foreign Secretary," Packwood said. "In fairness to him, he was always clear that there were conditions that would be unacceptable." In the movie, Halifax gives Churchill an ultimatum — negotiate or Halifax would resign. In reality, at one point, Halifax did threaten to step down, but the rift only lasted a few hours. In the movie: Churchill sends 4,000 troops to their doom. In reality: Most survived, but were taken prisoner. One of the more chilling moments in the movie comes when Churchill orders 4,000 troops at a garrison in Calais to fight the Germans as a delaying tactic to buy time for the hundreds of thousands of soldiers waiting on the beaches of Dunkirk. Whatever dialogue the scriptwriters created, they did not overdramatize this grim, calculated decision. As the notes from the May 25, 1940, War Cabinet put it, even as the unit was down to three tanks, the Prime Minister said that "it was imperative that we should hold on to Calais and he had arranged for a heartening message to be sent to our forces." The British and French defenders were overwhelmed. Hundreds died. About 3,800 British and French soldiers were taken prisoner. In his meticulous biography of Churchill, Martin Gilbert cites Churchill’s May 26, 1940, telegram to the commander in Calais. Churchill called on him to hold out as long as possible to aid the British Expeditionary Force at Dunkirk. "Have greatest admiration for your splendid stand," Churchill wrote. "Evacuation will not (repeat not) take place." That night, by several accounts including Churchill, he told his top military advisor General Hastings Ismay that he "felt physically sick." In the movie: Churchill gives one of his most famous speeches on May 28. In reality: He gave that speech on June 4, 1940. Purists might despair at how the movie jangles the sequence of events. It bolsters the sense of accuracy with dates, setting off sections in bold captions on the screen such as "May 9, 1940," "Monday, May 13, 1940" and so forth. The later it gets, the more liberties the film takes. Most striking is the last caption "English coast, Tuesday, May 28." As far as any movie-goer would know, Churchill on that day gives a towering speech in the House of Commons vowing to "go on to the end." "We shall fight on the beaches, we shall fight on the landing grounds, we shall fight in the fields and in the streets, we shall fight in the hills," he declared. "We shall never surrender." Churchill did give that speech, but it was not on May 28. It was on June 4, as the nation rejoiced in the successful evacuation of the troops at Dunkirk. In the movie: Churchill thought of using small boats in the evacuation. In reality: The Navy started lining up those boats earlier and on its own. The movie has Churchill giving the go-ahead for Operation Dynamo, the military name for the evacuation of Dunkirk on May 28, when the order came on May 26. Watching the film, you would think Churchill thought up the idea of using small private boats to get troops to safety. In a scene set in the middle of the night, he wakes up Admiral Ramsay on May 19 to suggest it. The record here is more complicated. First of all, Britain’s navy anticipated a possible evacuation much earlier than the film suggests. Military historian Duncan Anderson at the Royal Military Academy at Sandhurst wrote in 2011 that "the Royal Navy had already begun moving destroyers and transports to the south east on May 15." To give Churchill his due on supplementing that with private boats, on May 20, the War Cabinet minutes said, "The Prime Minister thought that as a precautionary measure the Admiralty should assemble a large number of small vessels in readiness to proceed to ports and inlets on the French coast." But assembling that flotilla of ferries, fishing and pleasure boats was already in the works. According to records collected by a private group, Forces War Records, as early as May 14, "an order was broadcast at 9 a.m. that day, requiring all owners of ‘self-propelled pleasure craft between 30-100 feet in length’ to register their boats with the Admiralty within 14 days." Walter Lord’s The Miracle at Dunkirk said the initial call for small craft was linked to efforts to neutralize magnetic mines set by the Germans, but the key fact is that the registry was already in place. "The Small Vessels Pool was organized by the Admiralty in 1939 and used mainly for port security duties," Richard Langworth of the Hillsdale College Churchill Project told us. It turns out there’s a historical debate over how Operation Dynamo got its name. In the movie, Churchill tells Ramsay to come up with one and the camera drifts over to show a fan in his office bearing the Dynamo label. The most common story has to do with the headquarters in Dover where the operation was planned. The main office had once housed an auxiliary lighting system called the dynamo room. Lord wrote that "by association" the Admiralty gave the operation that name. Historian and author Roberts disagrees. By established practice, Roberts said, it was called Dynamo because "it was the next on the list of approved Admiralty operation code names." In the movie: The King stops by and Winston hops the tube. Some wonderful scenes in the movie simply never went down. A night time visit by King George VI to Churchill’s bedroom "is a meeting that never occurred," said Bishop. "There is no evidence for such a visit, and it would have been highly irregular for the King to pay an unannounced visit on his Prime Minister and to interfere directly in the political debate in this way," Packwood told us. Also pure invention: Churchill’s ride on the London underground where he talks to ordinary people and draws strength from their resolve to beat the Germans. "The prime minister’s office engagement cards in the National Churchill Library and Center in Washington indicate precisely where Churchill was virtually every hour of the war," historian Roberts wrote in The Times Jan. 28, 2018. "If he ever threw off his entourage we would know about it from one of the 20 diaries being kept by those around him." The movie created a secretary for Churchill named Elizabeth Layton. Bishop said she is a composite of the many secretaries that served Churchill. There was no single person on whom he relied. However, Bishop told us there was an Elizabeth Layton in that group. And lastly, Bishop and others note that while the movie has Churchill on the phone with President Franklin Roosevelt, in the early years of the war, the two relied on telegrams and letters. The substance of the call, Britain begging for American destroyers and air planes, was very true to the mark. In the movie, Churchill gives his famous V for victory sign, but he does it backwards, that is, palm facing inward. His secretary gingerly clues him in that doing it that way means, "Up your bum." Whether Churchill truly didn’t know that is up for debate, but he did do it both ways. And as Bishop told us, when he did it backwards, he generally "had an impish look." Winston Churchill, HU 90973 from the collections of the Imperial War Museums.